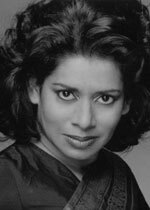 Patricia Rozario was born in Bombay and studied in London at The Guildhall School of Music with Walther Grüner, winning the School's Gold Medal and the Maggie Teyte Prize. She has sung in recent seasons with Solti, Ashkenazy and Gardiner, given performances at Wexford, Aix, Glyndebourne Touring and Opera North and sung recitals in France, Germany and London's Wigmore Hall. Her wide concert and opera repertoire ranges from Baroque to contemporary. Recent engagements have included a series of Tavener's works at the Athens Megaron, performances and recordings of Vaughan Williams with the BBC Symphony under Andrew Davis, Bach's St John Passion with Malgoire, Britten's Les Illuminations with Daniel Harding, Handel's Atalanta in Halle and concerts throughout Britain and Europe. In the 2001 New Year's Honours, Miss Rozario was awarded the OBE.